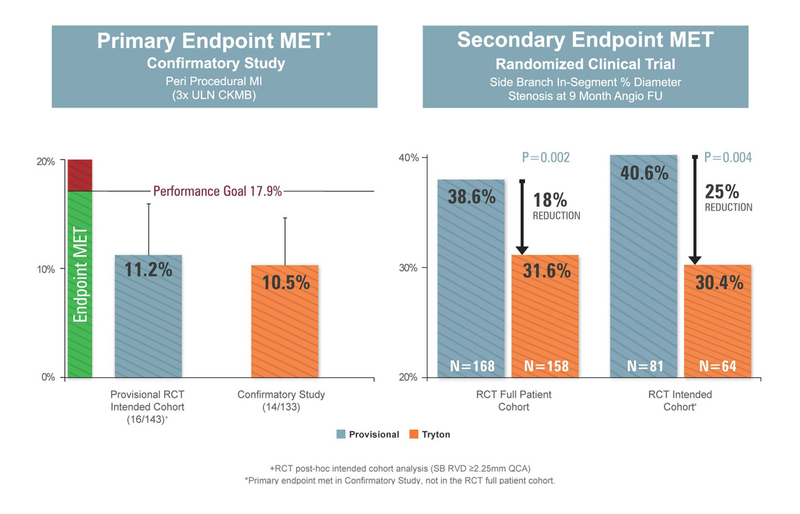 The landmark Tryton IDE study was a multi-national randomized trial that compared a Tryton stent in the side branch vs. the use of balloon angioplasty in the side branch, with both arms of the trial utilizing a standard drug eluting stent in the main vessel. 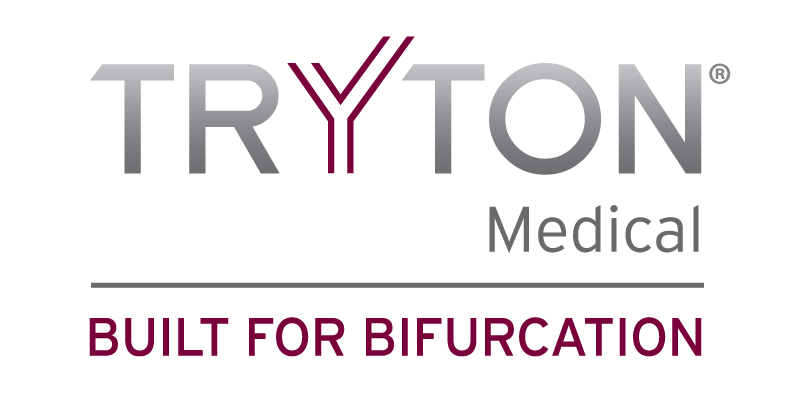 The study, which was the first and only randomized IDE clinical trial of a bifurcation stent, enrolled over 700 patients from up to 75 centers in North America, Europe and Israel. Martin Leon, M.D. (Columbia University, New York) served as principal investigator for the study and Patrick Serruys, M.D., PhD. (Thoraxcenter, Rotterdam) led the IVUS. D2296G_V01 Rev. 1 TCT2017-MON-PT5-100PM-CHRIS from tryton on Vimeo. D2301G_V01 Rev. 1 TCT2017-MON-PT5-100PM-SCHNEIDER from tryton on Vimeo. D2297G_V01 Rev. 1 TCT2017-MON-PT5-100PM-INTRO SPEAKER from tryton on Vimeo. D2295G_V01 Rev. 1 TCT2017-MON-PT5-100PM-ALI from tryton on Vimeo. CAUTION: Federal (USA) law restricts this device to sale by or on the order of a physician. For healthcare professionals only. Prior to use, refer to the instruction for use supplied with this device for indications, contraindications, side effects, suggested procedure, warnings and precautions. WARNINGS: Use of the Tryton Side Branch Stent in appropriately sized main vessels and side branches is required for safe and effective performance of the device. Do not use the Tryton Stent in small side branches [<2.50 mm in diameter by visual assessment or <2.25 mm in diameter by quantitative coronary angiography (QCA)], as its use may lead to an increased risk of adverse cardiac events such as myocardial infarction and the need for repeat revascularization. To confirm appropriately-sized side branch diameters, the diameter of the pre-dilation balloon inflated to nominal pressure may be used as a reference. Alternatively, the use of quantitative imaging methods such as on-line quantitative coronary angiography, intravascular ultrasound or optimal coherence tomography should be considered. Use of the Tryton Side Branch Stent, as with percutaneous coronary stent implantation procedures in general, is known to be associated with the following risks: Vessel thrombosis. Increased length of hospital stay relative to those of coronary balloon angioplasty alone. Judicious selection of patients to receive this device rather than balloon angioplasty alone is strongly advised. infection secondary to contamination of the stent may lead to thrombosis, pseudoaneurysm or rupture. The stent may cause spasm, distal embolization, thrombus, or could migrate from the site of implantation. Excessive dilatation of the artery may cause vessel rupture and life-threatening bleeding. Stents may not be fully expanded during deployment, particularly in resistant lesions. Stent dislodgment from the balloon surface during deployment and/or dislodgment from the target site post-deployment can occur. Major bleeding.